Second, there is a personal connect. Born as a premature baby, my immunity was as strong as a kitten. Any weather change had me sniffling and exploding into paroxysm of sneezes. It began with the common cold, followed by seasonal flu, stomach flu, eye flu and seasonal flu again. It was a bi-monthly unfailing occurrence. Much like the viral fever, I hated the pesky common cold. There were two ways of combating it. The first, easy way was to stop looking at every bout of cold as a curse. If you can’t beat it, enjoy it. A viral attack has higher purpose. Each spell is an excuse to spend quality time at home. It is God’s way of telling us to relax. Plus you don’t suffer alone. Rather unknowingly, you pass on the infection to wife and kids. So a family that sneezes together stays together. There were other advantages too. Common cold is a great leveler. Imagine the wicked kick of knowing that the intensity of your ‘Aachchoo’ matches that of Nita ben. The thought itself is empowering. The more sensible option was to boost immunity. The ugly truth is that more than two million (UNICEF) children die every year from preventable infections. All children have a right to achieve the highest possible standard of health. At a time when eatables are contaminated and antibiotic ineffective, boosting immunity is the need of the hour. So how do we build a nation of super heroes with super immunity? As I mentioned, my airways get inflamed with any weather change. A doctor suggested shots of inactivated influenza vaccine. According to him, the vaccine ensures safety only for some time. In case of an ‘antigen shift’ or a new mutation, the vaccine becomes useless. Moreover, most vaccines lose efficacy over time. Enough doctors do not recommend adult vaccination as they themselves are not aware of the preventive benefits. Children of course should be vaccinated according to the medical guidelines but I am not sure about adult vaccines. There are new guidelines each year which add to the confusion. Since I am scared of pin-pricks and allergic to chemicals, my only option was to find a holistic natural way. “Unfortunately, shopping cannot be your cardio,” said my doctor. Forsaking all the temptations of lying idle, I opted for yoga and pranayam. One has to begin early – walking, treadmill, Pilates or sport. Whatever works. Say A, B, C, D, E.
Every third child in India is malnourished. It is a given that immune soldiers need healthy nourishment. Some medications are necessary, but as far as increasing immunity is concerned, you need to look no further than your refrigerator. For me, a balanced diet with Omega 3 fats and anti-oxidants helped immensely. Apart from the benefits of gluten free diet (to reduce inflammation) I read about the merits of new super foods like Farro Wheat, Morel Mushrooms, Cacao Nibs, Adzuki Beans, Twig Tea and Chia and Quinoa Seeds. These are new fad foods and still under the lens. Personally, I prefer the safe, tried and tested route. 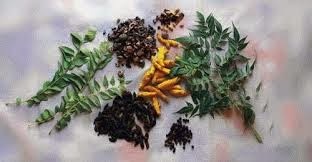 My favorite five have been Amla, Neem, Tulsi Turmeric and Ginger. Amla, in fact contains twenty times Vitamin C per pound found in oranges. It is a power food with loads of anti-oxidants and phyto-nutrients. 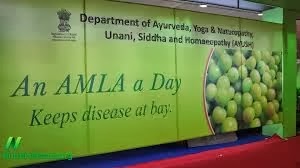 As it is bitter, I add it in my green chutneys.If an apple a day can keep the doctor away, an amla a day can keep the diseases at bay. My clear vegetable soup is not without a dash of crushed turmeric. It is proven that Neem leaves enhance immunity. The explanation is that Neem boosts the production of interferon by increasing the ability of macrophages to engulf foreign bodies. Tulsi has long been my herbal fix for seasonal ailments. At home, I have two pots, the holy basil (for tea) and Genovese basil (for pasta and salads). Modern science swears by it too. If you are interested, read ‘Herbs and Natural Supplements’ by Dr Marc Cohen, a professor at RMIT University. According to him the antioxidant content of tulsi is higher than grapes, ginger or garlic. Read Here On a cautious note, avoid anything that lacks scientific backing. Stressful situations reduce the cellular immune response. So even before you try any thing else, try happiness! Happy kids make healthy adults. Happiness is, as they say, nothing more than good health and a bad memory. Aan choo.Time to take my daily spoon of Chyawanprash. I mentioned that I am prone to allergic rhinitis. Didn't I? See, it is not that I am disease free. But a holistic approach has reduced the frequency of viral attacks significantly. 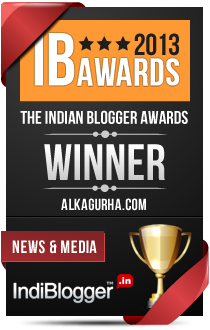 Hoping to build an immune India, this post is written for Dabur Chawanprash in association with Indiblogger. Good, timely reminders. Thanks, Alka. Loved the post! I am in the aacchooo phase right now and haldi ka doodh has come to the rescue :-) all the best! It has become a bi monthly unfailing occurrence. Hope you are better now. Wise and witty post. Very apt, and so relevant especially in modern times when we've all but forgotten the long way of tradition that we've been brought up in. Maybe along with immunity to diseases, we need to develop a thick skin towards the marketing gimmicks that make their rounds everyday in the media. And of course, we mustn't believe anything that doesn't have a scientific backing, many companies are blatantly swindling money from clueless customers. Now thank you for this. I read many contest posts and trust me when I say this, yours was the best. Good luck with the contest. I wanted to write this. The contest was incidental. But your comment means a lot. Best treatment for AAchhhoooo is a hot cup of milk with haldi. Yes, it is good for inflammation. Tried and tested. Ooops...I'd rather weather cold than force myself to ingest Chawanprash, Not an apt comment for this post *sheepish grin*. But like you said, a balanced diet combined with a fitness regimen can do wonders to your body. Not many like the taste. I have developed a liking for it. being a maturely born baby myself.. I know all that's there to know about weak immunity..
To me this is for sure one of the winners!